Herbivores tend to need frequent, large amounts of food while carnivores tend towards smaller, less frequent feedings as the carnivore diet is protein based and so more time is needed to breakdown, process and digest. Many reptiles also benefit from fasts and breaks in their feeding schedule. So read up on the needs of your pet and feed accordingly. Remember that any reptile that lives in an aquatic or semi-aquatic environment should have any leftover food removed after about 5 to 10 minutes, much like fish; otherwise the rotting food will pollute the water. Messy eaters should have a separate feeding area to keep their water from being soiled by food bits. Pre-killed frozen foods should also be completely thawed before given to your pet and preferably at least room temperature. Live foods provide stimulation and change for reptiles, plus encourage your pet to keep up its natural foraging behaviour. Wriggling insects, squirming worms and rodents that run and burrow can be the highlight of a reptile’s day. But be wary as live foods sometimes fight back and can inflict damage on your pet. For herbivores, live foods are a treat as well. Live branches and foliage give them something to explore as well as to feed on, you can mist branches daily to keep them vital for longer. Remember; never give your pet live food from an unknown source, like insects caught in your backyard. You don’t know where it’s been and what kind of pesticides or chemicals it’s been exposed to. Amphibians in particular are sensitive to pesticides but all reptiles can become seriously ill when exposed to chemicals and toxins. Again, to determine the amount of water a reptile needs requires some research into their natural environment. You can tell that your reptile is not receiving enough moisture if its eyes are sunken or its skin is dry and wrinkled. When you take the skin of a hydrated reptile between your fingers, it will fall back into place quickly, where a dehydrated pet’s skin will stay pinched and gradually fall back. A desert snake will not need the same amount of water as a lizard from a rainforest. A water bottle with a ball works well with most reptiles, though some like a container of water instead or a water bath to soak in. Tropical reptiles and those from moist climates should have their cages misted frequently, daily if possible. 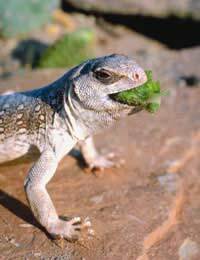 It can be difficult to fulfill the exact dietary requirements of a reptile in the wild, most species benefit from a supplement with their diet. For example, calcium and phosphorus are essential for the health of the reptile skeletal structure and shell, if it has one. Gastric acid helps to digest food and vitamin B-12 helps boost energy levels and appetite in reptiles. When purchasing supplements, make sure you check the expiration date to make sure they are still effective, however. Bacteria in meat can cause health problems for carnivores, particularly in the bodies of rodents. Pre-killed food that has been stored in a freezer for 30 days is the safest, healthiest way to get rid of any bacteria. Mealworms are a commonly food for carnivores but are low in calcium, something vital for the reptile health, and should be boosted with a calcium supplement for your pet. With herbivores, lettuce should be avoided since it has little nutritional content, veggies that are high in fibre and dark, leafy greens are best for herbivores. Spinach, however, is also a no-no as it stops reptiles from absorbing calcium properly. Why Isn’t My Pet Eating? If a reptile isn’t interested in food, the habitat temperature may be too cold, forcing your pet into a state of semi-hibernation. Your reptile could be a picky eater and need to switch to a different food source, given some stimulation with a live meal or be fed pre-killed prey. Your pet may be a nocturnal feeder, so try switching up mealtimes. Some reptiles are shy eaters and don’t like to consume food out in the open but will happily eat when fed inside a shelter, enclosure or hiding box of some sort. Overfeeding a reptile is another common cause of appetite loss; check the natural feeding schedule of your pet to ensure you’re giving enough time between meals for proper digestion.